We know you’re eager to get back to classifying wildebeest and other crazy critters, and good news is that Meredith has recently returned from the field with the next instalment of Snapshot Serengeti! So get ready! But we’re still in the process of uploading the photographs, checking timestamps, and doing all the other tedious but necessary pre-processing, and it will be a few more weeks before we get the next season online. So while you’re waiting, why not checkout the Zooniverse’s newest camera trapping project: Wildcam Gorongosa? 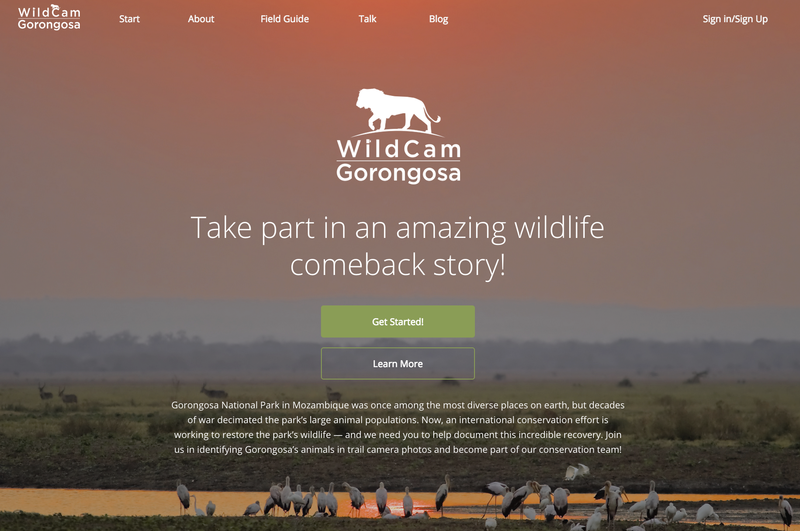 Nestled in nearby Mozambique, Wildcam Gorongosa was developed as a joint effort between the Howard Hughes Medical Institute Biointeractive Program, the Gorongosa Restoration Project, and, of course, the Zooniverse. Previously decimated by almost 20 years of civil war, Gorongosa National Park wildlife is rebounding thanks to an enormous conservation initiative. As part of that initiative, researchers have set out a grid of cameras, much like ours in the Serengeti. And now they need your help to identify the animals caught on their cameras. While many of the animals present in Gorongosa are the same as in Serengeti, they also have some critters we don’t: otters, nyala, oribi, and – my personal favorite – African wild dogs. You can read up a bit more on the project here, but why not head on over to Wildcam Gorongosa and see what you can see!